Who wants another free organizing printable? Today, I have a 2018 Yearly Calendar to share. It includes a Weekly To-Do List, Birthday Tracker, Monthly Calendars and a Year at a Glance Calendar. Add these printables to your household binder to help you stay organized all year long. 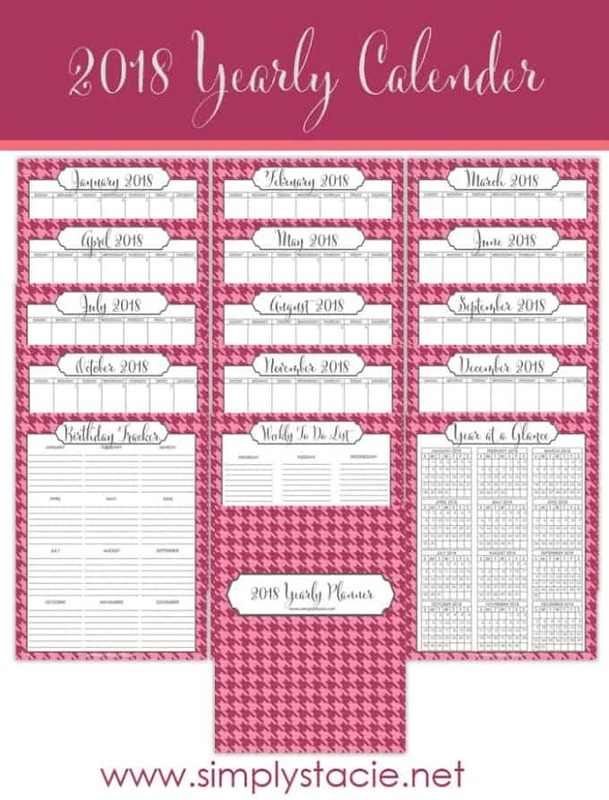 Click here to download your 2018 Yearly Calendar Printable. I have this free printable in another design if you prefer! This is great! I have been perusing planners and calendars but haven’t found the right one yet. This printable is a good start in the meantime! These are nice printables. I don’t have a planner yet this year, and these are ones I’d like to print when I can get to a printer. Love these printables! i have been shopping for a good planner but i could juse use these awesome printables! I love your site and your printables. They do so much to help me stay organized. I did notice that July 1, 2018 is started on Sat on your printable – the first is actually on a Sun – so that month is a day off. Again, thank you so much for taking your time to help other people in such a creative way. Thank you so much for sharing your lovely organizing printables; they are very helpful!